Please send me more information on Cabo Legend! A 100’ twin masted brig wooden sailing ship, the spectacular Cabo Legend sails the high seas around Los Cabos in unforgettable style with pirate-themed cruises! She is a mighty ship with plenty of deck space to eat, drink and be merry. Gather on the deck with friends and family, with lots of space to keep watch for pirates and enjoy the fresh salt air and warm sunshine. 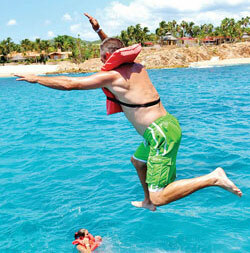 Our oath as pirates on the Cabo Legend is to please our guests; no wish is too big, no desire too small. A cruise with us will change your view on life (not just because of the eyepatch)! Come enjoy a whale watching trip, snorkeling cruise or the “Pirate Night Party” with us and enjoy an experience you’ll never forget! Whales, Sails & Tall Tales! Discover the gentle giants aboard the 100+ foot wooden brig classic pirate sailboat. 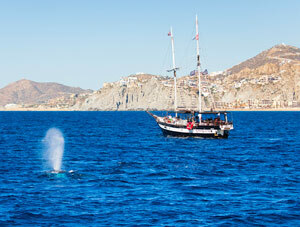 Encounter the whales as the early pirates did as they reached the Baja peninsula. We tell you about the whales, their lifestyle and habits as you watch them jump, play and float near the boat. While we chase the whales enjoy fresh fruit, complete Mexican style breakfast and open bar. Even champagne mimosas! Also learn about how the Baja region was discovered and the pirates that sailed its seas. Excellent ambiance and hands-on activities with our crew. Fun for all! Tour runs from December 15 to April 14. Complete breakfast, open bar, music and games with the MC/Guide. Discover the best way to enjoy a day: on the water. Cabo has been home to pirates since the 1500’s. We cruise back into time aboard our 100 foot wooden early 1900’s pirate sailboat showing you the world famous arch while telling tall tales about Cabo history and the pirates that sailed its seas. Strike our real working sails and drop anchor to get quality time with the tropical fish. After you walk the plank to snorkel, enjoy a lunch of beef and chicken burritos, chips, salsa, guacamole, not to mention the open bar. Grog (pirate rum punch), mai tai, margaritas and lots of juices for the kids. We mix some Baja stories and a lot of fun. Ideal space for those looking to get lose, relax and act like a real pirate for a day. 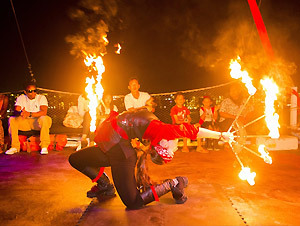 Enjoy great music, fun and hands-on activities with the crew until we return to the dock! Lunch, open bar and hands on activities with the MC/Guide. Hop aboard our wooden pirate ship and hoist sails as part of our hands-on pirate adventure. Hear tall tales of Cabo’s pirate history and secrets. Enjoy the wind in your hair and the famous Baja sunsets as you feast on mouthwatering BBQ ribs and chicken with the galley secret pirate recipe (we pirates hate canned products) plus wines, beer or tasty cocktails from our open bar. Chant, dance and shout with our pirate crew as they show you how to have fun like only pirates can. Guest participation is highly recommended. This cruise will have you talking like a pirate for a few days but the memories will last a lifetime. Avoid the rush and the mid-day sun. Get on board and enjoy the full breakfast buffet. Pancakes, eggs, bacon or try the Mexican favorite chilaquiles all made fresh on board. Grab a coffee or juice and enjoy the famous Arch. Tour runs from April 15th – December 14th. Private charters are available. Please ask your Cabo Specialist for details and rate information.